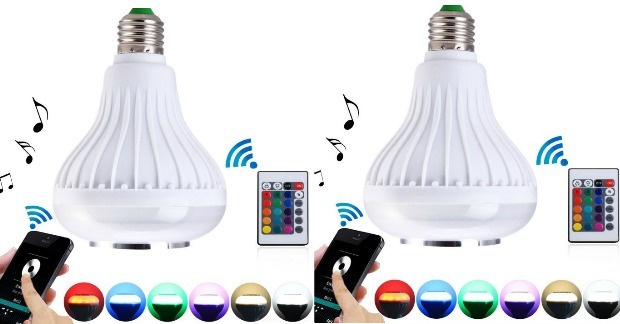 Color Changing Light Bulb Bluetooth Speaker Just $14.69! Down From $30! You are here: Home / Great Deals / Amazon Deals / Color Changing Light Bulb Bluetooth Speaker Just $14.69! Down From $30! This is a fun toy! I love gadgets – I can’t get enough. This is a color changing light bulb Bluetooth speaker with a remote! The reviews look really good – who wouldn’t love this. You can change the music and the color with the remote. Right now it’s on sale, you can get it for $14.69 which is down from $30! That’s less than 1/2 price (didn’t think I could do the math, huh? :P)! It’s not always practical or cost-effective to have a sound system in every room of your home. Now, this RC light bulb will suit you perfectly, and meet your needs: A LED light bulb with built-in Bluetooth speaker.